For the last year YS and I have been studying French once a week (4.5hr on Saturday!) 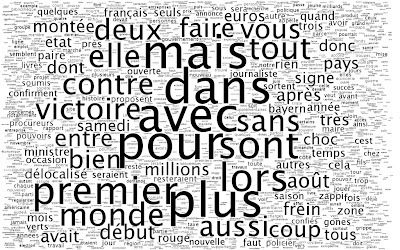 A few months ago I wrote some Python code to read the RSS feeds of the most popular French newspaper site, and then kept track of the count of each word. I repeated this every week for a few months. In the end I had a database of the top ~3000 words used on the site. Today I decided I wanted to play with Processing, so created this little word collage. It is 1680x1050, my monitor's resolution. Two thumbs up for Processing!